Lush tropical gardens, 45 ft wrap around patio set in traditional Mexican style. Welcome to the Casa Linda Estate where memories are made to last a lifetime.! This charming Casa is built and tastefully decorated in traditional Mexican style with a 44' covered wrap around patio, surrounded by tropical foliage. There are oversize equipale chairs for your comfort while you listen to the rippling waters of the fountain adjacent to the patio and overlooking the pool. There is also an outdoor dining area for those wonderful alfresco dinners cooked on your own private grill. This one story Villa boasts a king size bed and full bath with a spacious sitting area that completing the Master suite. The living/dining/kitchen area includes corner beds and another full bath. Beds can be put together for sleeping for one or 2 people. Set n the beautiful sandy beaches against the fantastic natural setting of the Bay of Banderas is the ultimate in vacation living! Make all your vacation dreams come true in lush tropical gardens with orchids,and bromeliads, water fountains, birds arriving daily for their baths in the waterfall that falls gently into the pool, majestic palms swaying in the breeze, and the beach right outside your door. 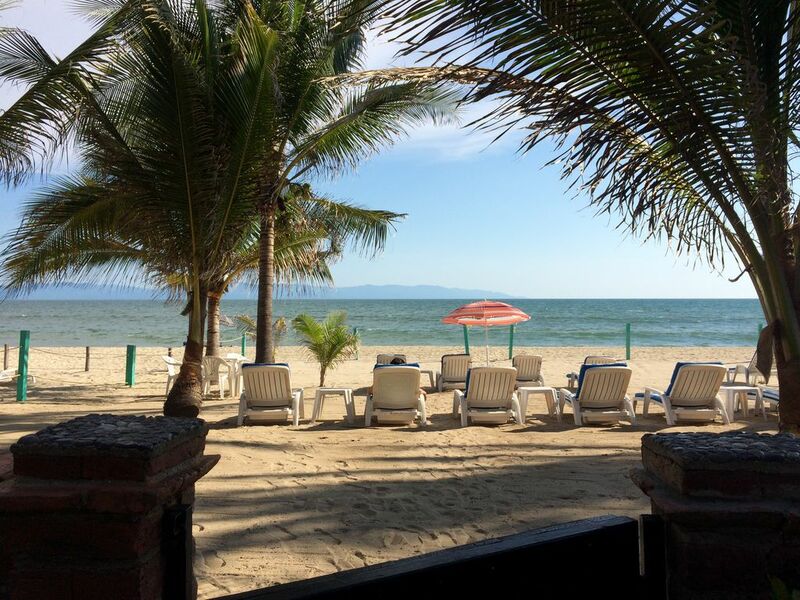 Stepping through the gate, experience the old Mexico tradition of bargaining with the vendors on the beach or having margaritas under the 30 year old coconut palms while watching one of the most glorious sunsets of your life or just relax and feel the ocean breezes and enjoy. Enjoy dining al fresco in secluded shaded covered patios surrounded by fragrant tropical flowers and many species of palms. You can rent 1, 2 or all 3 casas for family gathering, weddings or a group of friends . Please read the description of Casa 2 and the Casita below. The Casa Linda Estate is located in the quaint village of Bucerias (in English – diver) just 20 minutes by taxi from the airport. You will find we are comfortable, affordable and private. Our staff caters to your comfort, relaxation and needs to make sure you have the best vacation possible. The grounds are filled with lush tropical plants, majestic palm trees, fruit trees and fragrant flowers. All Casas are equipped with A/C, BBQ grill, Cable TV, DVD, and WiFi. Maid service is offered 6 days a week and a chef is available upon request. The Casa Linda Estate is perfect for weddings, family or friend get togethers, honeymoons, reunions, golf groups, fishing (some of the best!) or just relaxing and enjoying life…….it just does not get any better! Spend the day lounging by the pool or on the beach where we offer a private area for our guests. It is a great place to relax under the palms, read a book, play some dominoes, do a little shopping from the local vendors or take a walk on the best sandy beach in the Bay. The CASITAis a bungalow with a kitchenette and queen size bed. There are 2 covered patios, 1 overlooking the beach and the other overlooking the pool and lush tropical gardens and the other is palapa covered and is 10 steps to the beach and pool . Sleeps 2. BBQ on your own private patio . I love the tropical gardens, the rare flowers and the birds that always stop by to say hello. It is wonderful to see my guests relaxing and taking a break from busy lives. Casa Linda is like a home away from home without the stress. I also enjoy seeing people getting married at my place-beach weddings are amazing! My favorite time of year is when all my best friends from Texas come for their annual visit! Full bath with bath/shower off the bedroom and full bath with shower off living room. Cobblestone streets, plenty restaurants, shopping, fresh fish markets and all services available. Center of town offers beach front restaurants, tianges, town square, open church and much more! Private beach area with plenty of Palm trees, loungers and space for everyone! Watch beautiful sunsets, read, swim or perhaps try boogie boarding. Then take a dip in the pool! maid can service your laundry for a tip for her. maid can service your laundry for a tip for her time. Street parking but there is one space that can be reserved for gated parking. Fully equipped kitchen and BBQ off the kitchen on the patio. Inside table for 4 or dine outside on our covered patio which has 2 dining areas. Extra large wrap around covered patio. Large pool with plenty of space and loungers for all. Private chef (extra fee), open air baths, tropical gardens, unique bird life. Private beach area with plenty of space and loungers for everyone. Pool has a waterfall and is surrounded by plants, trees and wildlife. Easy to walk to all services, restaurants, bus and town! We spent a lovely week at Casa Linda 1 3/2019. It is top notch on all levels. From the owner Lori, manager Beverly & Christina & Cinto, you are well cared for ! So great to get away from the hotel life and settle in at Casa Linda for a true vacation. Cozy home, comfortable bed & pillows, well stocked kitchen & all your needs covered. If you forget anything the Casa Linda team will help you out. We have been coming to this beautiful vacation property for 15 years. Starting with morning coffee on the beach to afternoon cocktails on the patio we are never disappointed. We always feel very much at home with Lori and the staff. We totally enjoyed our stay. We didn’t want to leave. The home has everything you need to just move in. The pool and gardens are beautiful and the beach is amazing. We hope to be back soon. First I would like to say that you won't find a better place to stay in Bucerias. Casa Linda 1 was fantastic. As soon as you walk through the gates of the property you feel like you are in a tropical paradise. Inside Casa Linda 1 we immediately felt like it was home. The entire property is fantastic! Next I would like to say that Lori is such a nice person. She made sure that we felt at home. Her decorating skills are second to no one. We would definitely stay there again, without hesitation. We were close to everything, within walking distance of most everything. And if we wanted to travel, all we had to do was walk up the street and catch a bus. We went to Puerto Vallarta, Puenta Mita and La Cruz. La Cruz has a great market on Sundays and the fresh fish can be purchased most any day. While there, we ate at the marina club. Fantastic views and food. At Puenta Mita we went on a whale watching tour. It was great. We visited Old Puerto Vallarta, that wasn't for us because it was a little to commercial for us. The PV airport is located only 25 minutes away and makTes for an easy arrival departure. Casa Linda is within walking distance to restaurants, shopping, both large and small grocery stores, spas and you can enjoy a massage on the beach only 5 minutes away. Buses are a great means of travel and bus stops are only a 5 minute walk. Owner's Cancellation Policy DETAILS: When cancellation is less than 60 days and we can re-book your dates, a full refund will be given minus a 15% administration fee. You are welcome to use your deposit towards a future booking.